A US nongovernmental group, the American Black Group for Democracy has revealed that the Nigerian President, Muhammadu Buhari’s government plunged $500Million (About N150Billion) into the failed Hillary Clinton electioneering campaign fund, they added that the donation may create a huge misunderstanding between Nigeria and the incoming Trump’s US government. The Nigeria integrity challenged President, wasted no time in releasing the funds he reportedly pledged to the US secretary of states, Sen John Kerry and US Ambassador in Abuja to support of Mrs Clinton election. President Buhari an Islamist fundamentalist, have a visible hatred for Mr Donald Trump, especially when the US president elect allegedly made some statement which the Nigerian president sources claimed is demeaning and a threat to the Islamic faith. The Obama government, which Hillary Clinton served as Secretary of States frustrated the Nigerian former government’s war against the Islamist terror group, Boko haram and blocked every source of sourcing arms against the terrorists. The US group saw Buhari’s donation as an appreciation or a pay back to the Obama’s government that frustrated Nigerian government under Goodluck Jonathan in all front and used threats and intimidation to kick scare Jonathan out of office. 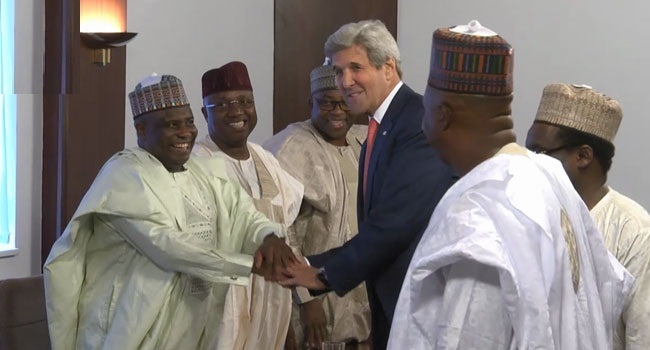 They added that Mr. Kerry’s frequent visit to Northern Nigerian may not be unconnected to the process to release the funds, as Buhari later quickly mobilized some Northern elders and his party governors of Northern inner circle, helped to facilitate a quick and secret ferrying of the money with secured Presidential Fiat. The defeat of Hillary Clinton was received as a great shock by the Nigerian government, that was help to power by the polices of Mrs. Clinton as secretary of state and the $500m donation is now a failed project that may be investigated by the Trump government. Left alone, President Buhari should not have congratulated Donald Trump because of the animosity he bears for the American. It took the intervention and criticism of Nigerians to force President Buhari to congratulate the US President elect, Mr. Donald Trump, as the Nigerian Seat of government was thrown into turmoil when it became certain that Trump has defeated Buhari’s favoured candidate, Mrs. Clinton. All the world leaders including those from Africa made a straight phone call to congratulate Mr. Donald Trump, but President Buhari battling the fact that the incoming US government is aware of his hefty financial support to their opponent (Clinton) developed cold feet and choose to congratulate Trump through a twitter post. Nigerians were shocked about this revelation that Buhari was busy funding a US presidential candidate, while millions of Nigerians are starving to death as a result of the recession caused by his clueless and directionless economic policies. So Nigeria has such money we are suffering in this country, buhari govt have not done anything concerning the country economy, this man is wicked he don't deserve to live the bible say suffer not the wicked to live, Nigeria president is wicked. this is exactly what is going on in the zoo called Nigeria since he goat (buhari) took power from the back yard.Our GOD is not as sleep.buhari doesn't deserve mercy he must be punished. all hail Biafrans all hail prince Nnamdi kanu. All the investment of the islamist terrorist world on Hillary Clinton came to naught. God raised Trump at this time for a purpose. The unequivocal support from Biafrans will be appreciated by President Trump in due course, especially, when he realizes Biafrans stood by him when virtually all the world showed only animosity towards him. Trump is a winner and so are Biafrans. Please Biafrans, let us wait, what the ongoing President Trump will do for BIAFRA, when he comes on power in january next year. It will be a stony way for him because, the whole western world is trying to block him. What is the name of the American Black Group for Democracy? I have been asking and nobody seems to know the source of the information. hoping Trump will investigate!! !